Welcome your Loved ones home for the holidays with this Cute Welcome Sign.. 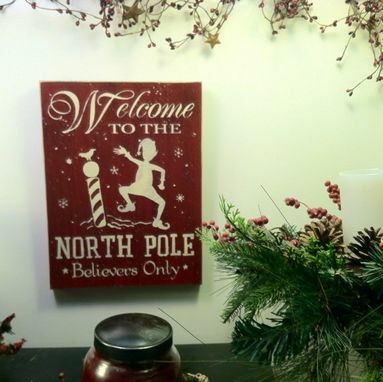 Welcome to the North Pole.. This sign measures 9x12 in. The background is done in a Burgundy and font White..
and finished. We sand the edges of the sign to give it a more rustic look but if you would prefer not to have the edges sanded just let me know at checkout. We protect all of our signs with a Poly Acrylic Matte finish. A saw tooth hanger is attached to the back for easy hanging.